In response to the theme of Abandon, the artist took 99 of the creative tools she had used and then cast aside (through having changed mediums) over the previous decade – paints, brushes, camera, laptop, modem – and transformed them into art objects. She did this by binding each of them in kilim wools from the village in Iran her mother had left to move to Tehran and then the UK. 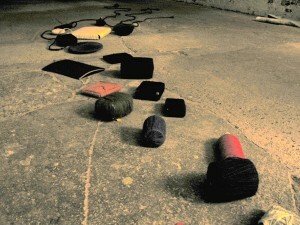 She then arranged these objects on the floor of the Substation, as a homage to the recent re-occupation of the formerly abandoned Substation space by artists. 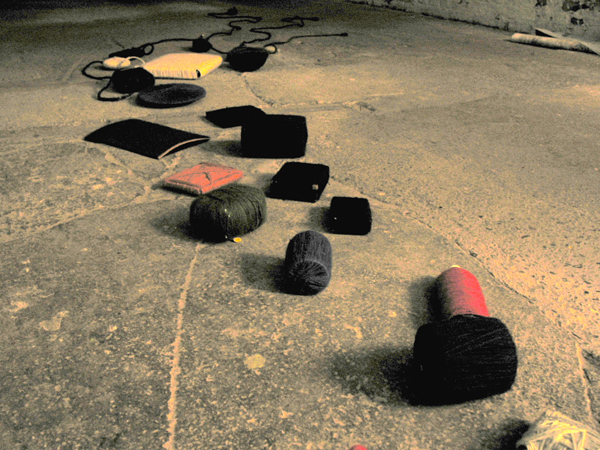 This work was the seed for her 2010 installation, the Gifts, 100-999. The show was curated by Paul Hazelton of Limbo Arts and works were developed by15 artists. Visitors were given torches and invited to explore the works in otherwise total darkness.